For coastal exploration, there's a lot to be said for a long, slim kayak which you sit inside. See The Sea Kayak. However there are many other small boats and one of them may work for you. Just be aware that if you take a canoe, a very short kayak, a rowing boat or a small sailing boat onto exposed waters you may find its performance alarmingly bad, even dangerous. Think Inuit / Greenland / Arctic. 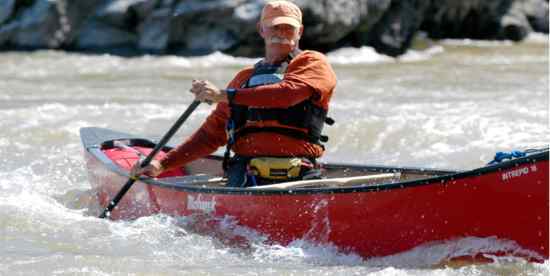 A kayak is a long, low, slim boat, usually pointed at both ends. It is propelled by one or sometimes two kayakers who sit on the bottom of the boat or on a very low seat and use paddles with a blade at each end. A kayak has a deck which covers the entire boat except for a hole (cockpit) in which the kayaker sits. Traditionally the cockpit is an opening to the inside of the hull, and the kayaker wears a flexible skirt which, when attached to the rim of the cockpit, seals the kayak and keeps the kayaker's lower half dry and warm. An alternative is for the hull and deck to be sealed together and the cockpit to be just a shaped depression in the deck. See Sit-On-Top Kayaks. Either way, the kayak will not fill with water in rough conditions. 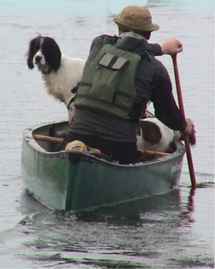 Kayaks are available to suit very different conditions. The drawing shows a 7 ft river playboat, an 11 ft 5 in Dancer general purpose kayak, and a 17 foot sea kayak. Kayaks are seldom more than 24 inches wide. A traditional sea kayak for an adult is usually between 14 ft 10 in and 18 ft long and and between 18 in and 23 in wide. See The Sea Kayak. Baidarkas are long, slim, light boats which look very similar to Greenland kayaks but are often noticeably faster. Think Aleutian Islands and Alaska. Like a Greenland kayak, a baidarka is covered by a deck except for cockpit(s) which can usually be sealed with a flexible skirt for use on rough water. Most are for one person but there may be cockpits for two or even three persons. Baidarkas come in many shapes and sizes and may be longer and/or wider and/or deeper than the typical Greenland kayak. Some have been built which are large enough to carry sail and have the crew sleep aboard. They are usually powered by paddles which may have a blade at each end or a single blade. 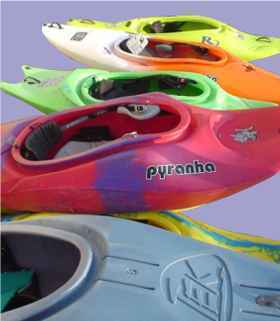 The ends of a baidarka are a different shape to those of a kayak. The underside of the stern is sometimes a complex shape so that at low speeds, like the stern of a kayak, it lets the water close behind it without fuss and barely leaves a wake, but at high speed it operates like the stern of a surfboard or racing dinghy, cleanly breaking away from the wake. The bow usually has a bifid or bifurcated shape, being cleft into two parts, one above the other. Opinions differ as to the reason for this. George Dyson is probably the leading expert author. For a technical discussion see his article Form & Function of the Baidarka: The Framework of Design. The full text is on Google Books, free. Last time we looked it was here. Baidarkas are usually hand-built by their owners in skin-on-frame construction. The underwater cross-section of a baidarka is usually more rounded than the boxy, angular shape of a hard chine traditional kayak because they are usually made with double or triple chines. An open boat, pointed at both ends, propelled by paddlers who either kneel or sit on a raised seat, and who use paddles which have a blade at one end only. Think First Nations. Think Birchbark Canoe. Usually a two-person boat but there are solo versions. 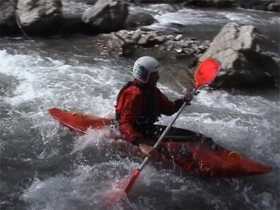 Great on whitewater rivers, as in this image courtesy of the US Coast Guard. A canoe is wider than a kayak, seldom less than 33.5 inches wide, and capable of carrying a heavy load. They don't surf well on sea waves, although it is fun trying. Some like to add a sailing rig for lake cruising. One design feature that makes canoes superb for touring on whitewater rivers is their high sides. That height makes them hard to control in windy conditions on open water. So, even packed with flotation like the whitewater canoe below, they are not generally suitable for use on the open sea. Verlen Kruger would not have agreed with us there, and he certainly had the experience to speak with authority. See the link to Kruger Canoes in the "sailing canoes" section of Retail Outlets. The outrigger canoe is a completely different beast. Think Hawaii, Tahiti, New Zealand. 6 ft 6 in - 10 ft long depending whether it's a true playboat, creek boat, river-running boat or whatever, this is the aquatic equivalent of a BMX bike. Intended for use on steep rivers or to do stunts such as spins, cartwheels, dips and blunts. Playboats are designed to spend a lot of time vertical. They're as tough as old boots, quite light, readily available secondhand, they look cute and they're colored like jelly beans. You can fit seven or eight in the back of an Econoline for road travel and even take them by air as "sports equipment". Your editor spent two years living next to a river in the Alps and has three whitewater boats himself so he's not anti-playboat, but he thinks potential purchasers need to know they have limitations. On flat water, they are a slow, tiring, wet ride. They resist attempts to go at more than walking pace. On exposed waters such as the sea they are uncontrollable in windy conditions. Especially the ones with flat square bottoms, which are wonderful at surfing speeds but otherwise have the hydrodynamics of a tea tray. All are hard to tow in an emergency, tending to turn sideways and then turn over. Many have little room for flotation in the form of plastic foam or buoyancy bags. If a playboat is a good fit for the user's height and weight, its short length and the low volume in the ends make it possible to do stunts, but what if it isn't a good fit? A lot of children aged 10 to 13 get an adult-size playboat as their first experience of kayaking... your editor's personal opinion is that it's a disastrously bad boat for a child. They don't have the weight or the reach to do playboat manoeuvres in an adult-sized boat, which makes it just short, fat, slow, hard for a child to roll, and dangerous in many situations. 11 ft 6 in - 14 ft 6 in long. That covers a multitude from almost a playboat to almost a sea kayak. The big difference between a general purpose kayak and 17 foot sea kayak is that the longer boat loves to go in a straight line, and will keep on going even if you stop paddling for twenty seconds. A shorter kayak with a waterline length of 10 feet or less naturally wants to turn sideways and stop, and it takes technique and practice to keep it going straight. If you put a beginner in a short general-purpose kayak and set off for a trip (s)he will get tired out fighting the kayak. In windy conditions on open water (s)he may manage half a mile but will probably need to be towed after that. General purpose kayaks seldom have bulkheads so they need lots of flotation, preferably full-length foam pillar buoyancy and a full set of tailored inflatable air bags. A lot of kayaks now in the "general purpose" section of catalogs are only 9 or 10 feet long, which is fine if that's what you want but they are more like white water playboats. The 11 ft 5 in Perception Dancer is nice for short sea trips in good weather. Here's an image of the original, which was followed by variants for larger and smaller paddlers. As Perception say, the Dancer is "a classic that has got more people afloat than any other kayak in history". There's also a line drawing at the top of the page and photos below and here. The Dancer was the first great rotomolded polyethylene kayak. 24 inches wide with a streamlined shape, pointed ends, high rocker, oval cross-section, volume usually 255 liters, weight 37 lbs. In the 1990s you could see them doing Grade V white water, riding big ocean surf and going on many nice sea trips in good weather. The Dancer's long ends can be a problem on a very narrow whitewater river but they punch through stoppers in a way that playboaters can only dream of. The oval cross-section of the hull means that when a Dancer is sidesurfing there is nothing for the water to grab. The shape and cockpit design are very comfortable. If it lacks the ultimate strength necessary for real confidence on white water, the Dancer hull is a lot tougher than fiberglass and will take years of abuse. It is still a truly cool kayak for anybody starting the sport. A general-purpose boat 14 ft 6 in long by 23.5 inches wide and with low rocker is ideal for touring on lakes, mature rivers and the sea as long as it's not too wide and has a good seat, cockpit and thigh grips so you can roll it. A kayak that length needs some deck rigging to give a good handhold for deep-water rescues. A GP boat may not be as stylish as a Greenland kayak but it's a lot lighter, a lot cheaper, quite fast, and just as competent in winds of Force 0 to 3 on the Beaufort Scale. For Force 4 you may want some sort of skeg, Force 5 is probably not a good idea. Hey, no-fuss sea kayaking, why not.